This model fits the 2-bow frame. If you have 3 bows please order the 1953 model. We also offer the side curtains. The MG tops will not fit the kit cars. We offer it in the leather texture vinyl and upgraded Stayfast canvas. 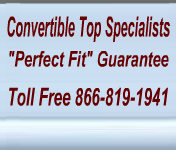 The MG convertible tops have excellent workmanship, superior fabrics and attention to detail that will ensure you will enjoy your convertible top for a very long time. 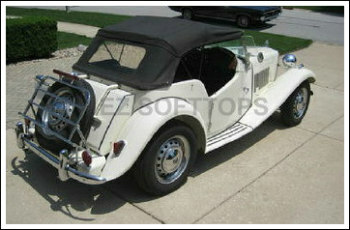 for your new MG convertible top. This top fits the 1950 MGTD convertible, 1951 MGTD convertible and 1952 MGTD. This vinyl is a leather grain vinyl with a cotton backing. Choose the fabric to match your top. Side curtains are made with sewn-in lower metal flap frames. You must reuse the chrome original frame.